Pilgrims face a leg breaking stage, with a demanding start and a steep descent until reaching Redondela. Pontevedra is an obligatory stop. Once again the route combines asphalt, for the majority, and mountain. The exit from the albergue of Mos involves a difficult slope of over half a kilometre. At the top pilgrims should turn right and a little further ahead the first of many bars appears. On this stage between Mos and Pontevedra there are also a number of furanchos or loureiros (a mixture between a bar/restaurant and a private house). After taking a turn off to the left and completing a stretch surrounded by trees, pilgrims return to the local road, which, is abandoned once again to take a narrow and steep short cut along an earthy path. Continuing ahead, pilgrims take another earthy track, on this occasion in descent. Here they will find the sandwich bar of La Cabaña de Guerri, serving diverse tapas and hamburgers and Bar Ángel. Back on asphalt, on the Camino itself, walkers reach the location of Vilar (Redondela) here they will find the artisan bakery O Parque and a sign for the rural tourist house Casa Figueroa. A yellow arrow painted on a wall diverts the pilgrims to the left towards the chargrill restaurant and bakery Choles, with a terrace. There is a very steep descent (careful cyclists). It is long and pronounced and the ground can be tricky. The route finds its way to the N-550, full of shops, the means by which pilgrims reach Redondela. Walkers say goodbye to this location by continuing parallel to the national road and the railway tracks, past the chapel of Santa Maria and the football pitch. Hikers then face a brief but demanding climb on the street of rúa Torre de Calle, however the views from the top of Ría de Vigo serve as good compensation. The Camino then deviates onto a cobblestone path that can be found on the left hand side to continue between mountain tracks and local paths until reaching, once again, the N-550, at a dangerous junction, without a pedestrian crossing and with poor visibility. At this point the Café-restaurant Jumboli is situated (it also has a rural guesthouse with various rooms). Once this hazard has been passed, now at the other side of the road, pilgrims travel on local roads to face one of the toughest obstacles of the stage. A hellish slope, although, half way through the battle they can rest in an area with a fountain and some benches in the shade (parque de Loureiro). A few meters before reaching the summit pilgrims should continue along an earthy track, which is taken on the left hand side. The terrain continues upwards although not as steep as before. The moment arrives when walkers can enjoy exceptional views over the estuary of Vigo. From here walkers descend on the Camino das sete fonts (the Camino of seven fountains) until returning to the N-550, but not without danger involved, this will accompany them until Arcade, although, fortunately just before reaching this location the route enters on quiet roads. 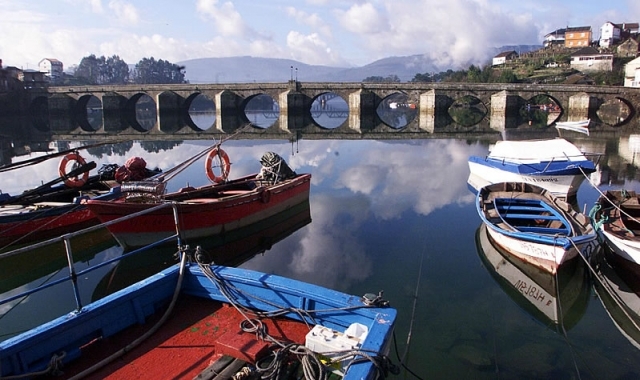 From the street of Roxelio Landeiro pilgrims reach the bridge over the river Verdugo, at the other side of the riverbank and, the charming location of Ponte Sampaio (in the council of Pontevedra). In this epic village it is worth paying close attention. The Camino is signposted but the narrowness of the streets it passes through can be confusing for pilgrims. In Figueirido walkers can quench their thirst at a fountain. A little further ahead there is a place offering cold drinks, fruit and chocolate. The chapel of Santa Marta (1617) leads to a junction with the EP-002, which, should be continued to the left. Along the pavement of this road, after passing the locations of O Pobo and Marco, the urban centre of Pontevedra is reached. Before reaching the centre itself pilgrims will find a few restaurants and even a chemist. The stretch from Mos to Santiaguiño is very steep although, cyclists can enjoy a short rest halfway though. Other complicated points of the stage include the exit from Redondela, its infernal Calle de Torre and a wall just after entering Cesantes. In Brea Vella da Canicouva cyclists will have to push the bike for a little over one kilometre although, they always have the option (not recommended) of continuing to Pontevedra by road. Check your bike breaks well. The descent to Redondela is complicated. Extreme precaution taken should be at the junctions with the N-550. 1 reviews Distance to Santiago: 95 km. 1 reviews Distance to Santiago: 85 km. 1 reviews Distance to Santiago: 77 km. 2 reviews Distance to Santiago: 65 km.